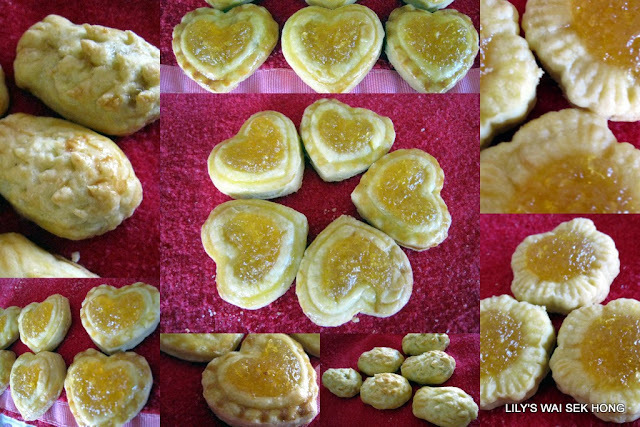 I would like to share some of the pictures of the Pineapple Tarts i made today with new moulds which Julie of Biodiversity Herbs.com sent me and the heart shape one is very appropriate for this year 2010 cos Valentine's Day falls on the same date - 14th February.as the Chinese New Year. The flower mould makes pretty tarts too but the pattern in the pineapple tart mould is not very deep, so i have to snip the pattern with a scissor. With the mould, it is faster and the tarts are more uniform.